Not the best NZ film, but an important one. 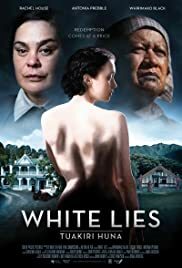 Adapted from Witi Ihimaera's novella Medicine Woman, White Lies doesn't have a particularly well told story at its core, but is nonetheless an important film for NZ to have produced. Set during the early days of settlement, the film depicts a sinuous power struggle between colonial housewife Rebecca (Prebble), her housemaid Maraea (Rachel House), and Paraiti (Whirimako Black), the Maori medicine woman whose particular skills and discretion are sought.